1990-1996 Nissan 300ZX All Model with 3.0L V6 Engine. 1987-1999 Nissan Maxima All Model with 3.0L V6 Engine. 1996-2000 Nissan Pathfinder All Model with 3.3L V6 Engine. 1998-2001 Nissan Altima All Model with 2.4L L4 Engine. 1990-1996 Nissan 300ZX Z32 Base Model with 3.0L V6 Non-Turbo Engine ONLY. Cooler air carries more oxygen, which translates into a more intense explosion in the combustion chamber to create more horsepower and torque. BCP Racing Air Intake Induction Kit. 1990-1996 Nissan 300ZX Non-Turbo NA Engine Only. Short Ram Intake. The air intake kit can help your engine to draw more cold air resulting in better throttle response and higher explosive horsepower output. 1990-1996 Nissan 300ZX All Model with 3.0L V6 Engine. 1987-1999 Nissan Maxima All Model with 3.0L V6 Engine. 1996-2000 Nissan Pathfinder All Model with 3.3L V6 Engine. 1996-1999 Infiniti I30 All Model with 3.0L V6 Engine. This mass air flow sensor adapter does NOT include mounting bracket, nuts and bolts. Back to Top. 1987-1999 Nissan Maxima All Model with 3.0L V6 Engine. 1996-2000 Nissan Pathfinder All Model with 3.3L V6 Engine. 1998-2001 Nissan Altima All Model with 2.4L L4 Engine. 1995-1999 Nissan Sentra All Model with 1.6L L4 Engine. 1995-1998 Nissan 200SX All Model with 1.6L L4 Engine. 1995-1999 Nissan Sentra All Model with 1.6L L4 Engine. 1987-1999 Nissan Maxima All Model with 3.0L V6 Engine. 1996-2000 Nissan Pathfinder All Model with 3.3L V6 Engine. Increase horsepower and increase air flow. This high quality Dry Air Filter will help to draw more air into your engine. As a result, it improves throttle response and more horsepower. We only take Cash for pickup. Buy more and Save more! Australia, New Zealand, Malaysia, and Rest Of the World. Ireland, Netherland, Greece, Israel, Poland. United Kingdom, Germany, France, Belgium, Italy. Red 3.00" Silicone 90 Degree Elbow Coupler/Reducer X1. Each Silicone Hose/Coupler/Reducer. All item send back with out authorization will not be processed. 3.00"(76mm) Inlet Universal By-Pass Valve Air Filter w/2 Clamp. Then the filter will be unable to have air flow. The bypass Valve air filter will help to resolve that problem. Cooler air carries more oxygen, which translates into a more intense explosion in the combustion chamber to create more horsepower and torque. BLOX RACING SILICONE INTAKE HOSE KIT. These high quality silicone hose kits are ideal when two components need to be. air filter kits. adjoined together and welding is not a viable option. Perfect solution for custom. 1993-1997 Infiniti J30 All Model with 3.0L V6 Engine. 1996-1999 Infiniti I30 All Model with 3.0L V6 Engine. 1987-1999 Nissan Maxima All Model with 3.0L V6 Engine. 1996-2000 Nissan Pathfinder All Model with 3.3L V6 Engine. It's the ultimate Intercooler Kit made by High Quality 6061 Aluminum Pipe. The perfect kit for the DIY or professional builder. Pipe Thickness: 2 mm. Pipe Overall Length: 18 in. This kit includes . RED 2.5" to 2.75 Straight 3-Ply Silicone Coupler/Reducer. All item send back with out authorization will not be processed. Color Temperature = 5000K, Super White. Xenon Gas Filled. 50% look brighter than your standard halogen bulbs. Back to Top. Buy more and Save more. Red 3.50" Silicone 90 Degree Elbow Coupler/Reducer X1. Each Silicone Hose/Coupler/Reducer. All item send back with out authorization will not be processed. The high flow Bypass Valve air filter can help your engine to draw more cooler air resulting in better throttle response and higher explosive horsepower output. (Most cars will require intake pipe or adaptor to use this filter). This high quality Dry Type Air Filter will help to draw more air into your engine. As a result, it improves throttle response and more horsepower. Back to Top. Buy more and Save more. We only take Cash for pickup. This high quality Dry Air Filter will help to draw more air into your engine. As a result, it improves throttle response and more horsepower. Buy more and Save more! RED 2.75" Silicone 90 Degree Elbow Coupler/Reducer X1. Each Silicone Hose/Coupler/Reducer. All item send back with out authorization will not be processed. 2 Xenon HID Xenon Bulbs. Garanteed anAC HID Kit (Difference between AC Kit and DC Kit can be seen below). This hid kit will last 10x longer than your halogen and use 1/2 the power. This kit will include everything you need to convert your halogen into HID Light like that ones you see on luxury car. Silicone 3-Ply Coupler/Reducer x1 and T-Bolt Clamp x2. Surface Finish: Silicone. We only take Cash for pickup. For high temperature and high boost application. Back to Top. (Most cars will require intake pipe or adaptor to use this filter). The high flow air filter kit can help your engine to draw more cooler air resulting in better throttle response and higher explosive horsepower output. We only take Cash for pickup. All item send back with out authorization will not be processed. Red 2.50" Silicone 90 Degree Elbow Coupler/Reducer X1. Each Silicone Hose/Coupler/Reducer. All item send back with out authorization will not be processed. 3"(76mm) Inlet Universal By-Pass Valve Air Filter w/2 Clamp. Then the filter will be unable to have air flow. The bypass Valve air filter will help to resolve that problem. RED 3.00" Straight 3-Ply Silicone Coupler X1. All item send back with out authorization will not be processed. 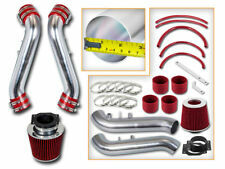 GSP Red Short Ram Air Intake Kit Filter For Nissan 90-96 300ZX Fairlady Z32 3.0 V6 Non-Turbo. T-306 Aluminum High Quality Finished Intake pipe as shown in the picture. High quality built Washable and Reusable Air Filter as shown in the picture.